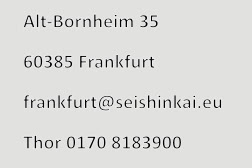 Seminar mit Sharon Friedman im Seishinkai | Frankfurt SEISHINKAI - sei du selbst. Jemand anderes kannst du nicht sein! Wir hatten ein wundervolles Seminar - "the Inner Sword" - mit Sharon Friedman aus Tel Aviv. - We had a wonderful seminar with Sharon Friedman. "There is no such thing as relaxed and tensed. Simply differnet levels of tension. Some is useful and some harmful. Be vigilant in your awareness to your tension and bring the right amount to each breath." "All the shapes and movements of the earth an sky are within you. Allow your spirit to manifest in new forms, movements and thoughts. It is called being alive."